When I taught eighth grade math, we used the Glencoe McGraw Hill Algebra I (2010 edition) textbook. It was awesome for solving equations, writing linear equations, and evaluating with exponent rules! However, it was missing three-dimensional measurement, transformations, repeating decimals, estimating radicals, and of course, two-way tables. 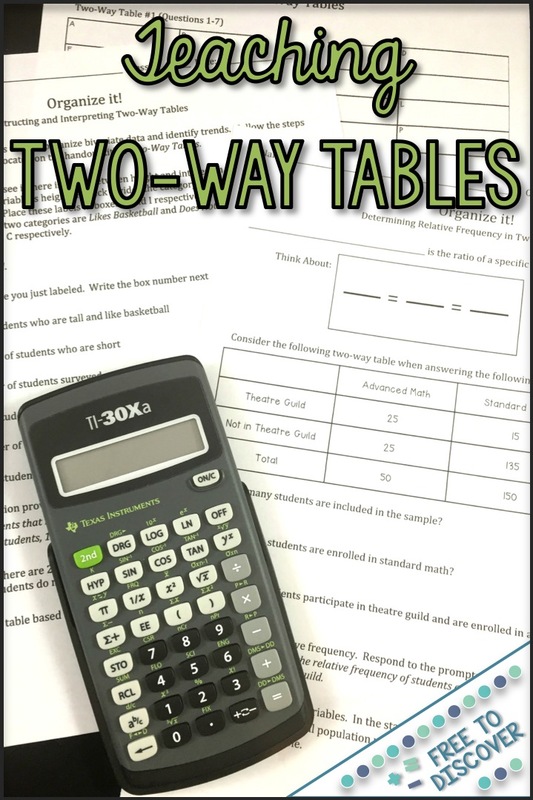 When two-way tables was added to our standards I spent a lot of time relearning the topic so that I could create meaningful, accurate resources that would help students really understand the importance of the skills they were developing. I do believe it’s important to summarize the big ideas in the form of notes once students have had exposure to the concepts. The notes I use in my class are always differentiated based on the needs of the students. Most students get regular fill-in notes, but others get a copy with the examples already filled in so that they can focus on listening the lesson without having to write everything down. The final copy has everything filled, and is perfect for students who have been absent. The corresponding practice sheets are differentiated by ability level. There is an advanced version and a basic version. I also include a one-page version of the basic copy that has less problems but meets the standard level. Check out notes for Constructing and Interpreting Two-Way Tables and Calculating Relative Frequency here! If you're looking for some St. Patrick's Day fun, scoop up these awesome set of partner stations! What are your favorite activities when teaching two-way tables? Any tips or tricks to share?